Here are the stages I go through from log to finished bowl. Each bowl begins as a section of a log, chain-sawn to rough shape and screwed onto the faceplate of my homemade lathe. Next they are turned using gouges and/or boring bars, and sanded smooth while still on the lathe. I turn them thin, so that they warp rather than crack as they dry. Because they warp, none are perfectly round, but each takes on some unique shape, accentuating any irregularity already there in the log. Greenwood turning allows me to make larger, deeper, more varied bowls than possible with dried lumber. There is a strong element of the found object involved, as my wife and I scan roadways, yards, logging sites, and even woodpiles for interesting pieces of fine hardwoods. Maple, cherry, walnut, oak, apple, peach, poplar, hickory ... there is so much variety in the trees native to our area. My mission is to preserve some essence of a tree in each bowl, and make something beautiful out of what might have been discarded otherwise. from the piles along my driveway. to lines down the side, if I need to center the faceplate on the other side. Next. an electric chainsaw knocks off the corners. Six 1" screws surrounded by six 1 1/4" screws hold the 4" dia. faceplate on. The blank is mounted on the lathe and spun to see how centered it is. Turn on the lathe, slowly increasing the speed. I use a 1/2" gouge to rough out. You can see the oval taking shape. The final cut is a fine shearing pass with a sharp gouge. Next the inside is hollowed out, using the same 1/2" gouge. 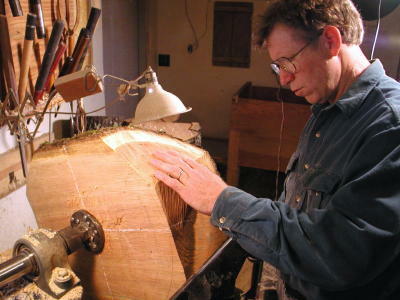 It takes a steady hand to initiate the cut on the outer rim, which has large voids in it's spinning path at first. Wooden calipers check for thickness as I work my way down. to use a ruler to set the final depth for a 3/8" thick bottom. 80 grit to 400 grit, finally ending with a white scouring pad. 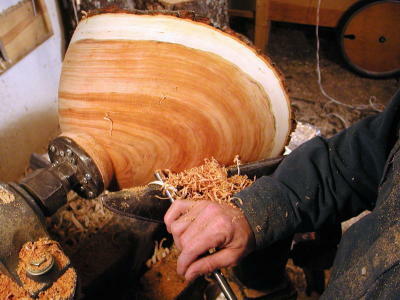 The whole process usually takes longer than the turning.